Something to look forward to: Cupertino introduced its newest operating system at WWDC 2018 today. The latest version of macOS is called Mojave and features many changes to the desktop and GUI. Many of the changes deal with the look of the desktop environment and imaging options. The next version of macOS is right around the corner. In sticking with its California-based naming theme, the new operating system will be called "Mojave." Unlike High Sierra's mostly under-the-hood changes, Mojave is bringing several updates to the GUI and other forward-facing user features. Working in front of a computer all day seven days a week, I am a big fan of dark themes like YouTube's dark mode. 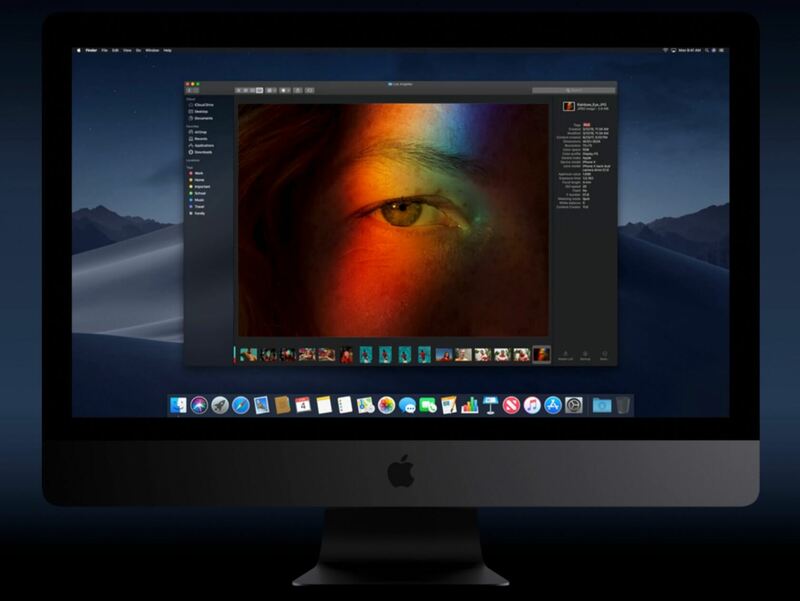 Apple will introduce Dark Mode with the next version of macOS. Users will be able to activate it at will, and it will apply a dark theme to the desktop and open windows. Dark Mode looks fantastic and is easy on the eyes. The mode is only available in the native macOS apps including Mail, Messages, Maps, Calendar, and Photos. However, Apple has released an API to developers so they can incorporate Dark Mode into their apps. Mojave will also have something called "Dynamic Desktop." Throughout the day the wallpaper will change to match the time of day. The effect is pretty cool. Another feature that is coming to the desktop is called "Stacks." In Mojave users will be able to quickly organize a cluttered desktop by "stacking" similar content into piles. Categories like type, date, and more can be defined to quickly clear away the clutter from your workspace. Finder has not been changed too much, but it will have a new Gallery View. As the name suggests, this mode will be ideal for folders containing images. It is similar to picture folders in Windows in that a row of thumbnails appears at the bottom with a larger preview above in the main pane. Markup and other editing features will be available right from the preview image. In fact, markup and editing tools will also be available within Quick Look now as well. Both images and videos will be editable within what used to be a very barebones viewing feature. Continuing with the imaging improvements, Apple has revamped screenshots in Mojave. Now whenever a screenshot is taken a thumbnail of it will appear in the lower right of the screen. Clicking it will bring it up in Quick Look where, as previously mentioned, it can be edited. What I find even more exciting is that now you can take screen captures directly from the screenshot utility. This is great for those who find using Quicktime or other applications a hassle when trying to create a demo of something on-screen. Capturing video right from the screen will now be much more streamlined. Mojave is also introducing Continuity Camera. This feature enables users to take pictures using their iPhone right within their workflow. For example, say you are using Pages to document a prototype device you are working on, and you need to insert a picture of it. Instead of browsing through folders for an image that you would have previously taken, you can execute Continuity Camera to take a shot on the fly. Once invoked, the iPhone camera app will start up. You can then snap the picture, and it will appear right in the document. Mojave is also bringing several native iPhone apps to macOS including News, Stocks, Voice Memos, and Home. These apps are just the beginning as Apple will be releasing tools to developers to help them port their iOS apps to macOS. These will be available in late 2019. The newest macOS will also bring several privacy protections to Macs, and to the Safari web browser. At the hardware level, Mojave will attempt to obfuscate information on Macs so that outside developers will have a hard time creating a "fingerprint" or profile of your Mac. Safari, which already implemented several privacy and security features in its last iteration will go further by blocking even more tracking sources. So as you can see, Apple has some significant changes in store for Mojave that aren't just performance fixes and behind-the-scenes optimizations. Mojave will give macOS a whole new look that will go hand-in-hand with the redesigned App Store. Developers can pick up a preview version of Mojave at the Apple Developer Program website as of today. A public beta is planned for late June with the official release slated for some time this fall. As with all new versions of macOS, Mojave will be free to all Mac users.